The long June day still allowed for several hours of hiking before dark, and while not time enough to hike to anywhere significant, time walking through the wilderness is fine, very peaceful, very centering, as my racing thoughts begin to slow. Not unexpectedly for such a long hike when I haven’t been doing it for a while, about four hours in my body started letting me know. I had been thinking about yesterday’s client, a young woman with cervical cancer, who said she “felt a heaviness lifting out” of her midsection. A hopeful sign. My nagging muscles complained more loudly. Still a few hours of hiking to go. I thought about the time I worked on Doug. He had snowmobiled into his camp for the weekend, 15 miles into the Adirondack wilderness (different spot than where I was—his is all private land), as there’s no road going in that far. Trouble was, it was very late winter, and the snow was both deep and soft. On his return to the main road, the snowmobile kept sinking into the snow every 20-30 feet, and Doug had to get off, hoist the snowmobile back, to travel another 20-30 feet—for 15 miles. Quite a workout. “I thought somebody was going to have to help me out of my truck,” he said about the moment he finally arrived home. He could barely move. But we had already set up a short series of healing/reconnection sessions to help him as he quit smoking, and he showed up for his session. Tired, moving slowly, but there. The next morning, he told me later, “I slept like a baby all night, and at 6:00, got up and felt terrific—not sore or stiff anywhere!” It was a story he repeated a few times to others (who became clients shortly thereafter). I thought about this as I felt my own pain and stiffness grow. I had just grabbed a shoulder bag, not a backpack, and even alternating sides, my shoulders and sides were feeling the strain. My legs were tired, and my feet hurt—not helped by the decision to wear flat canvas boat shoes instead of supporting hiking footwear. I had also been thinking about how reluctant people are to go for healing help, even when they’ve already experienced the benefits. They’re often hesitant to visit doctors, too, of course. We are all ego-driven creatures, and we like to do things ourselves. “Self-healing it is,” I thought. I focused on the healing frequencies as I walked, letting my back and shoulder pain slip away. Yes! I let it sink into my legs, and again, bit by bit, the pain and fatigue left them, even as I continued hiking. My feet were a greater challenge; I slipped into a gentle jog to use different muscle groups, and the pain subsided, not gone, but substantially reduced. Normally, once back to the car, the stiffness would set in, and the soreness greater the next day and especially the day after. But that’s just a belief! What if we didn’t buy into that? What if we believed in healing instead, in the inherent wholeness of our beings, in the sustaining matrix of light that we truly are? With at least 90 minutes left to the hike, I changed muscle groups by breaking into an easy run. I had plenty of energy. My dog, a husky, certainly didn’t mind a better pace. I let the energy circulate. I reminded myself I’m a structure of light, infinite, and let myself ride that energy. We picked it up to a faster run as we traversed the swamp, to avoid feeding the swarms of deer flies. But I felt great, and even the pain in my feet lessened with each step, if not vanishing. View from Mt. 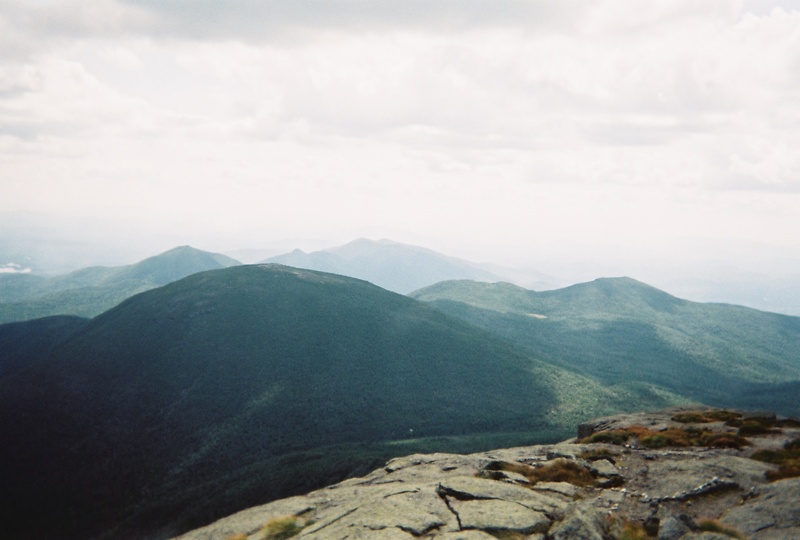 Marcy summit — a dawn to past dark hike. We so seldom listen to our bodies. We think we’re just our head, forced to let the damn body tag along. We can learn a lot from listening. I heard an interview recently with a man who had won a marathon for running backwards. “It strengths the calves and the back,” he said, extolling its virtues. One day on a forest walk shortly afterward, my back sore from gardening, I tried it—and the pain vanished instantly. I walked forward again—and the pain returned. That puzzled me. After a little back and forth experimentation, I realized my legs were supporting me better when walking backwards. By letting my feet stay on the ground just a little longer, stretching back just a little more before stepping forward, I could duplicate the effect walking forward. That easy. Instant healing. Simple body mechanics. But we don’t believe it’s that easy, or even possible. We believe in illness and disease. We believe life is a struggle. We believe we can’t always have what we want. It’s not true. It’s simply a belief. If there’s anything to be healed, above all other things, it’s this—our completely mistaken belief, the one created by ego and fear, the one manifesting limitations that simply don’t exist and that are not at all part of the natural world. We made them up. Back at the car, reluctant dog settled back on the back seat (where she promptly went to sleep), I took off my shoes and stretched my feet. Normally, here’s how this works—back in the car, no longer moving, muscles start to cramp up, stiffness starts to set in, and by the time I’m back home, moving is difficult, followed by soreness the next day that gets worse the day after, then rapidly healing from day three. Today, though, I did something different. I refused to accept the lie. I had just healed all my other back and leg muscles. My feet would be fine. A little more stretching—done. I was healthy, not cramping up. Period. And that’s what happened. Next morning, I could tell I’d been hiking, but none of the usual stiffness. My feet were fine. Later in the day, I had some mild stiffness in my hips (that’s a spot I didn’t think to heal the day before), but that was easily healed the same way I healed my back and legs. Two weeks later, I again went hiking in the Adirondacks, a full day of it, as I was looking to clear my head, and I find that takes at least six hours of wilderness hiking before things that were confusing abruptly become simple and clear. Plus it was a beautiful day. This time, though, I didn’t wait to get sore before I tried self-healing again—I applied what I’d learned from the last time right from the start. We are light. Everything is energy and frequency and vibration—Nikola Tesla and Albert Einstein, among others, told us that a century ago. Don’t accept the soreness, Tim. Light, frequency, vibration. And it worked! No back pain, no leg pain, at all, during the entire day. My feet got off to a better start, as I was wearing better shoes this time, but my toes, the balls of my feet, and a little of the sides of my feet eventually complained about the day long confinement and friction against the leather. “I’ll have blisters in the morning,” I thought, but then immediately, “No, don’t embrace that assumption. I’ll be fine.” I concentrated on the healing, and walked on. I also felt connected, ending the day with a strong sense of everything being lines and light energy. In the morning, after a long and peaceful sleep, I rose and felt absolutely fine. I could tell I’d been hiking, but with no stiffness anywhere, just a nice stretchy feeling of lines throughout my body, top to bottom, with no sore bunches anywhere. Nor did my feet have any blisters—but I did feel an intense heat in the spots where I’d normally have had blisters. If I focused on expanding the energy in my feet, I discovered, they would cool and the pain vanish. A few concentrated tries with this, and I was fine. At the end of the day, I had a mild soreness in these spots, but no pain and no blisters. All healing is letting go. It would happen much more quickly if we did. Awesome article Tim. It’s true what you say about believing in illness and disease. We have been giving our power away for far too long. I like how you ended the post. ‘All healing is letting go.’ as humans we find that so difficult. Thanks, Madonna. It’s our ego at work…it’s not difficult to do, just difficult to *want* to do. Eckhart Tolle talks about the pain-body…and we cling to it fiercely. But we do not have to do so. Felt like I just went on a hike in the wilderness! Thank you. I will go and check out your facebook page, as I can already feel how beneficial connecting with you and your teaching would be. Thanks Maeve! Liking the FB page (and adding it to your Interests lists, now that FB rules have changed) will keep you up to date about when the book comes out–as well as when I’m giving seminars, including free teleseminars. Thanks for sharing!